Don – The Chase Begins Again, directed by Farhan Akhtar, is a remake of the blockbuster 1978 film, Don. 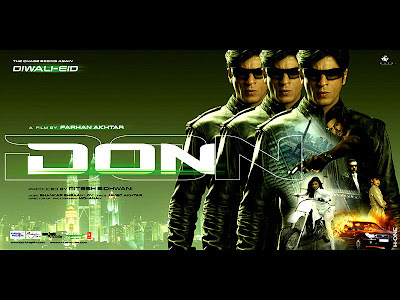 The film was released in India on October 20, 2006 and it was also simultaneously released internationally. It received a very good response worldwide. The script of the previous film was written by Akhtar’s father, Javed Akhtar and Salim Khan. The film stars Shahrukh Khan, Priyanka Chopra, Arjun Rampal, Ishaa Koppikar and Kareena Kapoor in a guest appearance. Eighty percent of the movie was shot in Malaysia, and was filmed around the tropical Langkawi island as well as the Petronas Twin Towers and the Jalan Masjid India area, which is the “little India” of Kuala Lumpur. Akshay Kumar was offered for the role of Jasjit but he rejected saying he might have accepted if he was offered the part of Don. Shahrukh Khan and Priyanka Chopra underwent special martial arts training for their roles in the movie. The original script [Salim-Javed] had the power to keep you involved and mesmerized for the next 2.30 hours. The new version lacks it. The sequence of events in the earlier DON unraveled at a feverish pace, which the entertainment-hungry viewer lapped up with glee and excitement. The new version moves at a sluggish pace at regular intervals and that indeed is bad news for a thriller. In fact, boredom sets in after a point and it also gets difficult to comprehend what’s going on. Things could have been simpler for sure. Every character in the earlier DON was well etched out. That’s not the case with the new version. Barring SRK and to an extent Priyanka, the remaining characters appear as mere caricatures. The songs in the first version were merged beautifully with the script. Somehow, in the new version, barring the Kareena track, the songs don’t take the story forward. Even the terrific ‘Khaike Paan Banaraswala’ comes across as an unwanted guest. It was well publicized and hyped movie at the time of release and got excellent response at box-office. It collected around 48 Crore at box-office from India only, with distribution share of 26 Crore approx. From overseas it did excellent business of 33 Crore. Total Worldwide Distribution Share : 42 Crore Approx. ~ by Yakuza on October 21, 2009. I hate SRK film don.this is the bad film and bad perfomance of srk.and u say that it is hit.I am not agree sir.this film was above average film,don’t say that its hit film.srk spoil the name of amitabh blockbuster film don.bad performance of srk in film don.srk did the role of vijay looks like she-male.too much different from real don.and too much problem in script of srk don.many friends said to me when they saw srk don that its boring film with no story then i said to them that watch the amitabh film don then u will know the story.so its bad film of srk and many peoples hate this film.and verdict is ABOVE AVERAGE. shakir, there is difference between personal choice and general perception, DON was semi-hit in India, but was big hit in overseas, SRK performance was in general face criticism because of stepping in shoes of Amitabh, as a vijay he face severe criticism, but as a don, reaction was diverse. This is Farhan Akhtar’s only movie that is plain BAD. Everything in the movie is wrong. Be it casting, acting, action scenes, pace. Many movies falter because of a bad script. This is one of those rare ones which falters inspite of a good script. would love it know your review on movie released with DON ….i am talking about JAANEMAN…also what you think about the movie if it was released…alone!!?? sure, you will find it soon here. Jaan-e-Mann would have been success if got chance of solo release. wrong release strategy was main cause of its failure. Hahaha yeah! DIL SE… was a far superior performance, DON, for the most, was sorely overacted! He mucked up the crucial character of Vijay to a buffoon! Check out the discussion at NG on the same post! It caused quiet a lot of commotion which I feel sad for, so I have apologized. Just today i realized such a long discussion over this thread and was wondering with V/S issue, this is quite natural that hot arguments generally bring out some unintentional bitter side of story. I loved the new DON. I think it is very tough challenge for a remake to find appreciation because the audience is emotionally attached to the original. My point becomes obvious when we see the results of RGV-Bachchan’s sholay remake. It wasn’t a bad film but it had to stand comparison with an all-time blockbuster. On the Boxoffice front also I think DON had a good opening and a good trending. This would have happened only on two conditions: 1. there was hype around the film. 2. People liked the film and spread a good word-of-mouth. 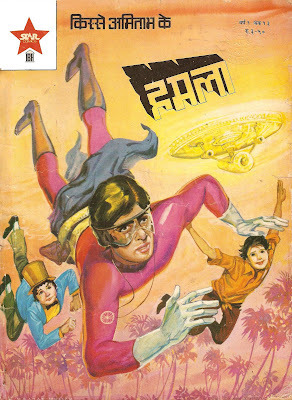 Contrast this with the sholay remake- it lacked both. Neither were the people interested in seeing the remake nor did they like the film. i search long ago the Score from this movie can somebody help me pls ? Meto, DON boxoffice operation has not been published Yet. Will try to upload soon. Please check back later. Shakir on BLACK (2005) – BoxOffice Operation. prakumsoon14051982 on BLACK (2005) – BoxOffice Operation. prakumsoon14051982 on Ek Tha Tiger Heading For Big Success !! vishnu on Ek Tha Tiger Heading For Big Success !! Randy on Ek Tha Tiger Heading For Big Success !! niinja on Ek Tha Tiger Heading For Big Success !! nitesh77nitesh on A record that will always remain intact, an interesting box-office history !! Randy on A record that will always remain intact, an interesting box-office history !! Yakuza on A record that will always remain intact, an interesting box-office history !! prakumsoon14051982 on A record that will always remain intact, an interesting box-office history !! Randy Lall on A record that will always remain intact, an interesting box-office history !! BLACK (2005) – BoxOffice Operation. Ek Tha Tiger Heading For Big Success !! A record that will always remain intact, an interesting box-office history !! Synopsis of Main Intaqaam Loonga, Mehandi Rang Layegi and Teri Kasam ! !